Another awful performance and the doom and gloom is back in full force on the message boards. 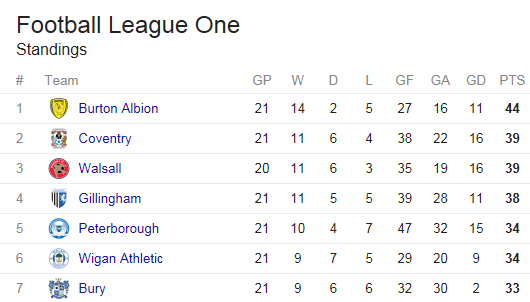 No wonder – within the space of a week Latics have lost at home to two sides in the relegation zone of League 1, albeit one defeat being on penalty kicks. With a budget more than four times higher than most clubs in the division can we not expect better performances from Gary Caldwell’s team? How much longer can we say that the team is still in the gelling process? Is it time to press the panic button? Max Power does not think so. This time a year ago Malky Mackay had been in charge for almost a month. Sadly Latics had not won any of their first four matches since his arrival, which had sparked mayhem from the media. But the optimists among us hoped that Mackay would get rid of the dead wood that was chewing away at the fabric of the club. Those were the players who just did not seem to care. They needed clearing out, with new players coming in who would give their all when wearing a Wigan Athletic shirt. The disastrous regime of Mackay will be etched in our memories for years to come. But there are lessons to be learned from it that should be borne in mind in the present. Fans had been peeved with what appeared to be a lack of effort from the players that Mackay had inherited from Uwe Rosler. It seemed to give Mackay carte blanche to jettison no less than sixteen of them in the January transfer window. Household names were dispatched for minimal transfer fees with hardly a murmur. Sadly the net result was that Mackay was left with a threadbare squad of dubious quality, with the numbers being made up by young rookies from Premier League and other Championship clubs. Relegation was the sad consequence. Caldwell is under pressure at the moment, but as Max Power said, it is not time to panic. Despite gaining only one point from their last three league games, Latics remain in the playoff zone, in sixth place, just five points away from an automatic promotion spot. At the start of the season, given the almost complete turnover of the playing staff, I for one would have been satisfied with a mid-table position by Christmas. Nor every Wigan Athletic fan was a lover of Roberto Martinez and his style of football. Many see Caldwell as an acolyte of Martinez. They see the frustrations of the Martinez era returning under Caldwell. Patient possession football is not the order of the day for those who yearn for the days of Paul Jewell’s 4-4-2. However, like Martinez, Caldwell will stick with his beliefs although he will surely be pragmatic enough to recognise when things are not working. Under managers such as Coyle and Mackay the hoof was the order of the day for defenders who did not know what to do with the ball. They were both poor appointments and set the club back on its heels. In the Caldwell era, as it was in that of Martinez, the hoof is frowned upon and players who do not have the self-confidence to do something imaginative merely pass the ball sideways or backwards. Martinez always had a creative player capable of unlocking a visiting defence. Shaun Maloney, Victor Moses and Charles N’Zogbia were totally different in their styles, but were capable of doing something special. Caldwell seemed to have that to some degree in Michael Jacobs earlier in the season, when he was playing in the hole between the holding midfield and the central striker. Jacobs was to be superseded by the arrival of Yanic Wildschut, who was devastating in his role of cutting in from the left wing, with blistering speed, not only unleashing powerful shots but providing superb assists. The advent of Wildschut, combined with a knee injury sustained against Shrewsbury, has impacted upon Jacobs’form. He has been too often pushed away from his best position towards the right wing where he is much less effective. Moreover Wildschut is now not only heavily marked by the opposition, but defenders have started to figure out how to play him. He is not having the same impact that he was a few weeks earlier. During the unbeaten run of eleven matches, Latics rarely looked like world beaters. So often good results were hiding unimpressive performances. But they had an attacking threat. The more forward players were running into space, looking to receive the ball. Midfield was coming up in support. In recent games these things have not been happening to the same degree. Too often a player can receive the ball in the middle of the field and have no other option but to pass the buck. Such a habit is contagious. Players who are fighting for their places in a very competitive squad are reluctant to make mistakes which can ultimately lead them to lose their place in the starting lineup. On Saturday Caldwell chose a starting lineup that must have been pretty close to his eleven best available players, based on their form over the course of the season. On paper it looked a positive team selection. However, choosing your best available players is not always the way to choose your potentially most viable lineup. Sometimes combinations of certain players just don’t work. You need the water-carriers and the flair players. It is the blend that is the key. Question marks remain about the viability of playing the two best central strikers – Davies and Grigg – with Wildschut on the left wing. Moreover none of the three are likely to perform the levels of defensive duties necessary to keep things compact. That, in turn, puts added pressure on the midfielders, who are expected to both support the attack and repel counterattacks. Wildschut is an exciting player to watch and has made a huge impression since his arrival. His permanence at the club could prove crucial to Latics’ promotion chances. However, Caldwell needs to consider how best to use him. In the Martinez days of 3-4-3 Victor Moses was essentially a winger with freedom to roam. He was not strong on his defensive duties. However, he linked up well with his wing backs. Both Emmerson Boyce and Jean Beausejour were excellent in those functions. One did not feel that Moses cramped their style. However, if Caldwell’s team plays 3-4-3, with the Dutchman in his preferred position on the left wing, one wonders about the difficulties the young left wing back, Reece James, must face. James is expected to attack, but his space is limited by having a left winger in front of him. The lack of recent form of Michael Jacobs is a concern for Caldwell. Jacobs is the main creative force at his disposal. To get the best out of the player he needs to be played in that central advanced midfield role. He also needs a good share of the ball. Haris Vuckic is an obvious candidate for a similar role, but has not even appeared on the bench in recent games. The lack of creativity in midfield has been a worry for Latics over the past weeks. Max Power and David Perkins are largely involved in physical battles for the dominance in the middle of the park. Caldwell faces the choice of playing two holding midfielders with two wing backs in the 3-4-3 system, or three parallel midfielders in a 4-3-3 formation. There are fans calling for wholesale changes in the January window. However, Caldwell must be cautious in his transfer dealings. Having endured problems in the gelling in of so many new players, he will be cautious about bringing in too many more. He simply cannot afford to have too much turnover, as happened in the Mackay era last January. Caldwell’s dilemma is that he may need to leave out some of his best players to provide a balanced and functioning unit. It is going to take some bravery on his part to do that.